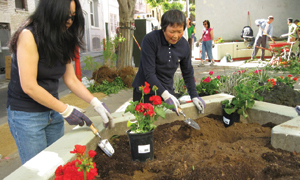 In October 2011, Neighborhood Parks Council and San Francisco Parks Trust came together to form the new San Francisco Parks Alliance (SFPA). Our first year has been marked by much of what you might expect— the kind of building, evaluation, and adaptation that is allowing us to deliver on the promise of the new organization— a stronger more effective voice for parks, healthy recreation, and open space in San Francisco. But, something else also happened that we had hoped for, and counted on— a confirmation of all the reasons why the two organizations came together. The deliberations, principles and philosophies spawned during envisioning a single, united voice for parks have been validated by you— our members, volunteers, partners and supporters, who have stayed with us. Thank you. You have stayed with us because if there is anything in our diverse, only-in-San Francisco city that brings us together, it is clean, safe, green places for all of us to play. In 2012, those places— San Francisco’s city parks— were named the best in the nation. This award highlighted a single moment in a trajectory for our parks that was put into motion in part by previous generations. Today, we are the beneficiaries of their vision and consistent support. But, today we also inherit the responsibility of preserving for the next generation the amazing beauty and sense of community we have built into our parks. 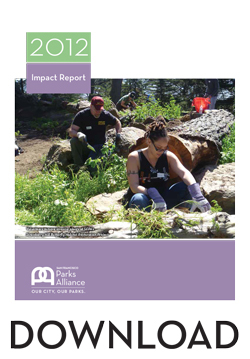 The San Francisco Parks Alliance has a vision for San Francisco parks and open space, drawing upon a combined 55 years of experience in advocacy and philanthropy, to ensure that a successful park trajectory continues. We’ve built a new, better organization with your help, and our many achievements are outlined here in this impact report. We thank you for your continued support of the parks and open spaces that contribute so much to our quality of life. It’s our city, and our parks. Let’s keep building it green.